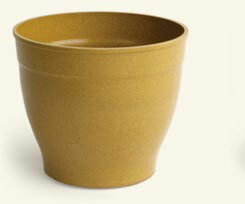 EcoForms pots are made from rice hulls and natural binding agents, which are starch-based, water-soluble, and bio-degradable. No pollutants are used or produced at any stage of the manufacturing process. And, because all scraps are recycled in the production process, no materials are wasted. Only a small amount of water is used in the binding formula, and the organic pigments are environmentally friendly. 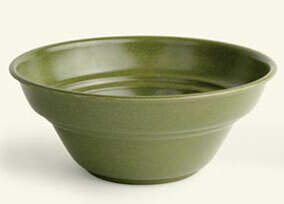 Heat and pressure bind the ingredients to produce EcoForms pots. EcoForms maintains a close working relationship with our manufacturing partners in China. The EcoForms manufacturing facility is family-owned, and the working conditions are clean, efficient, and respectful of the employees. - Designed to last up to five years outdoors, and up to twice as long indoors. - Suitable for all climates, environments and applications where plastic, clay or wooden containers are used. - Resistant to freezing and thawing damage. - Created with excellent heat insulating characteristics that result in outstanding root development and overall plant performance. - Effective at promoting drainage and ensuring proper air movement. 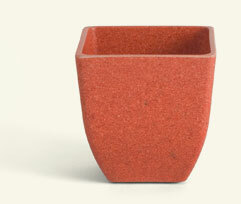 - A leading product in the sustainable gardening movement. © 2009-2019 Ecoforms. All Rights Reserved.